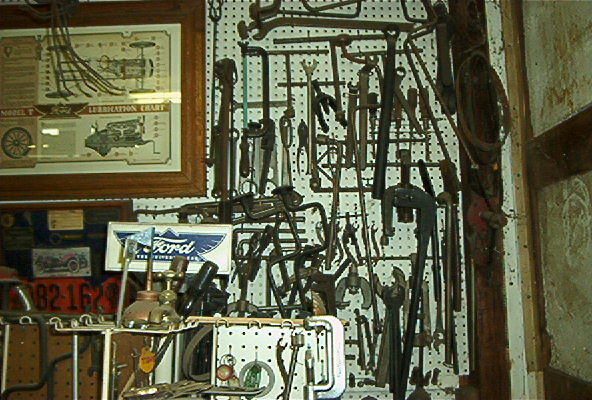 Mike Robinson was asking for pictures of some of the original Ford Shop Tools. I have a few and would like to post some pictures. 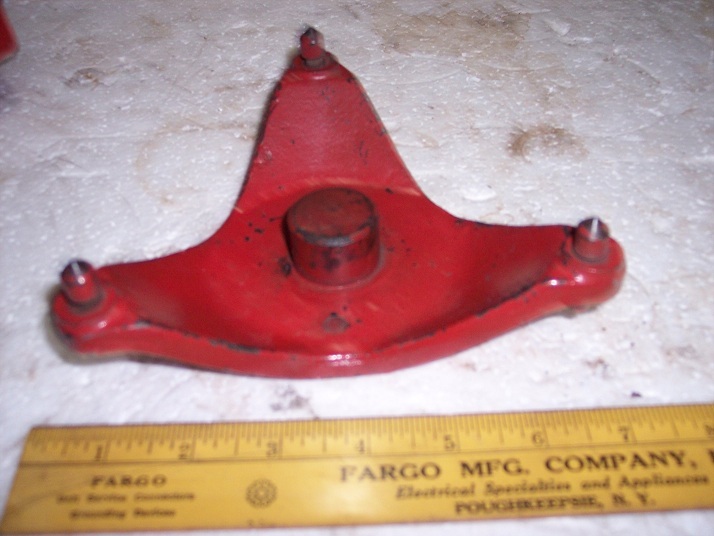 The first picture is Carburetor Flange Tools. Every one knows that it is not and easy bolt to get to on the back side of the Carburetor Flange. 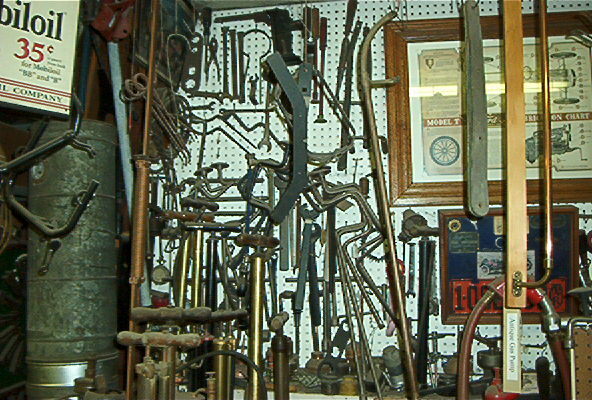 these tools were sold for that purpose. 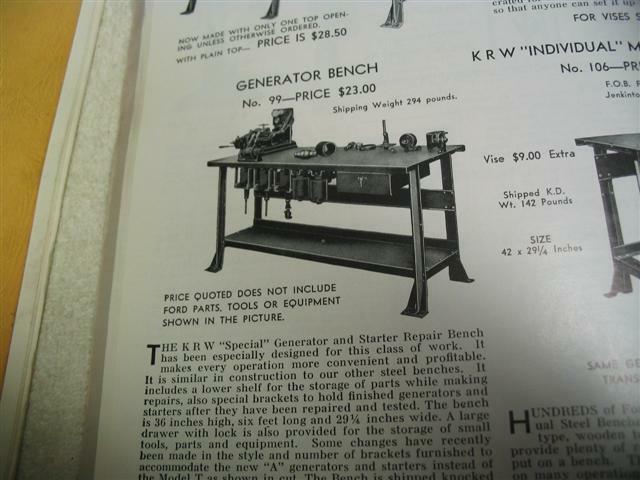 The Catalogs list the top one with dhe double sockets as also used on the generator bolts they are 5/8". 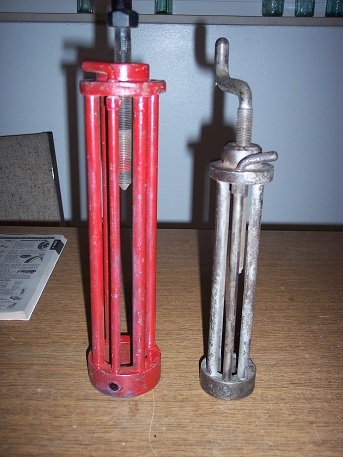 The bottom one is one I made out an original spark plug wrench. I forgot to put the name and number of the flange tools. 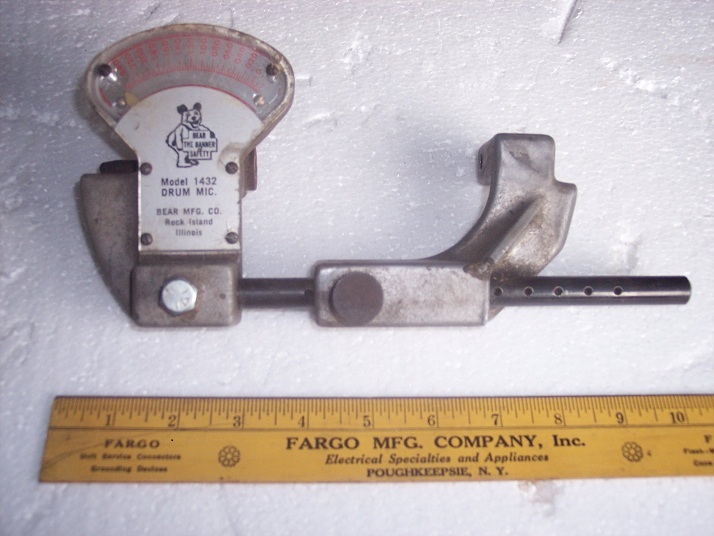 The top double end tool is a 5 - Z -817 tool with ford stamped on it. 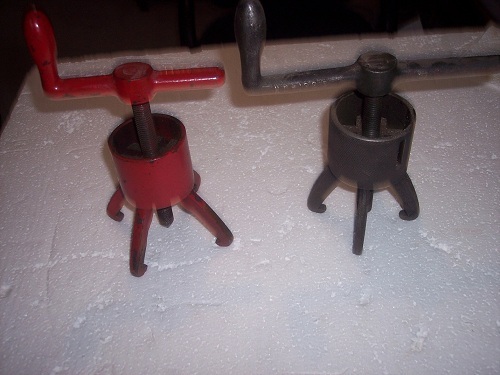 The two single socket end tools are Bog tools with no numbers. I find what few Bog tools I find that Bog Model T Tools to be good tools. The fixture above is for the 60 tooth speedometer drive Gears, the fixture below is for three other smaller gears, like the Ford Special speedometer heads. Again the round part of the fixture goes into the drum. On the fixture above you tap on the other end of the sharp points and make a dent in the spokes. That is where you drill your holes for the screws that hold the gear to the wheel. Thank you Dave. I now know more than I dis before I read your post! I had never seen reference to those tools. Thanks for the response. 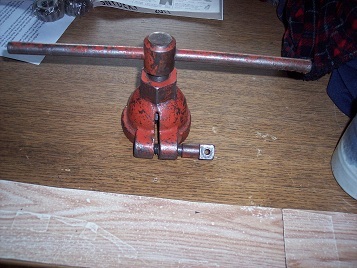 I have a picture of a tool I have the trouble truck take on tours when I am wagon boss. When someone breaks an axle you can bolt this device to the backing plate and then install your wheel. That will allow you to be pushed around and loaded on the vulture wagon and unloaded when you get home. This picture was taken on a Center Door with a broken axle on one of the earlier Colorado/Wyoming Tour South of Walden, Colorado. I am having a lot of trouble working with a new photo program. Kodak sold their photo program that I have used for years, so I hope the following picture is posted. 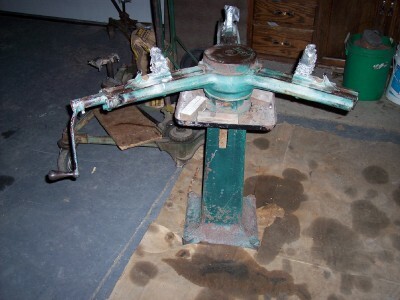 This is a shop wheel puller, I have never seen any others like it. I doubt that many had this puller other than Ford Shops. If you can see the square shaft handle with the hole that is where a brass handle went. I used to be able to spin the puller on with one finger using the brass handle then tighten the puller. The brass handle broke and I have never got around to fixing it so I just use a 5.8 open end wrench. Note: this is one of my most used original tools. I agree Dave - that puller is also the "work-horse" in my shop for rear wheel removal. 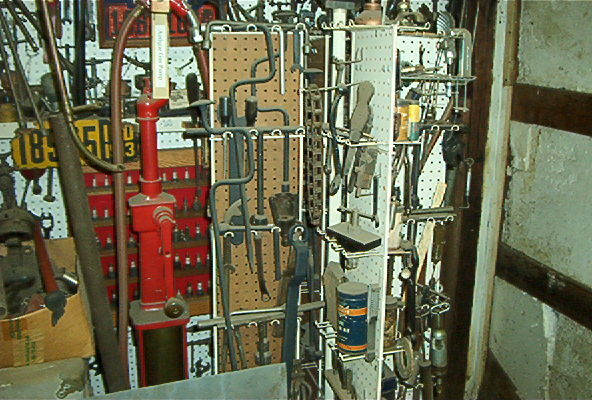 Here are several photos of my mostly "Ford" shop tools. Here are a few of my 40+ year collection. Nice Jack - I like the rear end lifting set !!! 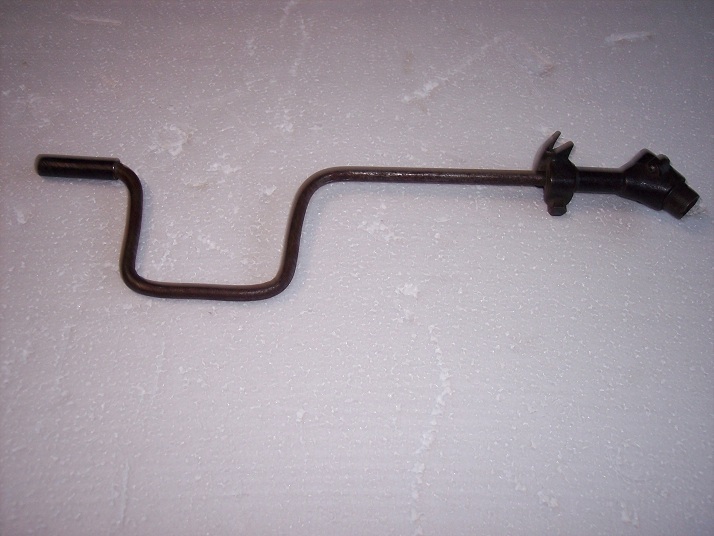 Steve,it is hand forged from two Model T rear axles. What is the small black tool in the center of the lifter ? What are the two black pullers just to the right of your two spoke stretchers in the first picture ? 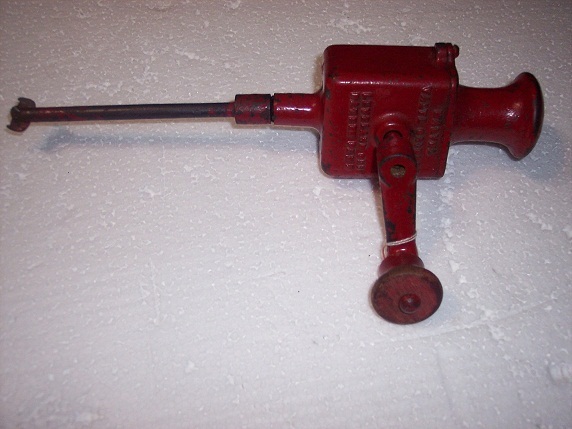 Not to steal Jack's answer, but that tool is an Allen Electric Model T generator brush cap bearing puller. 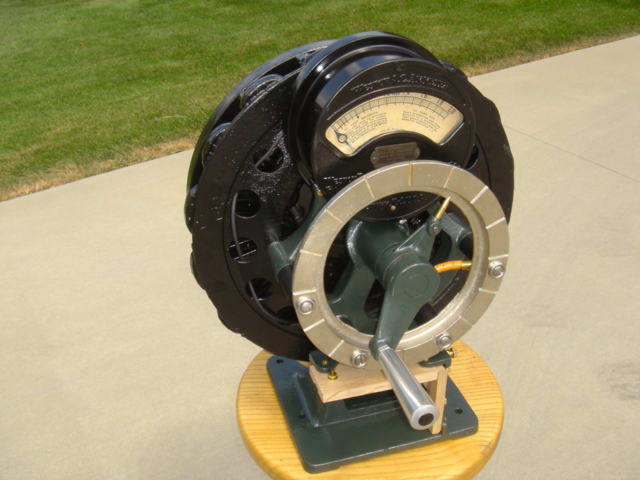 It came in the box of many tools for the Allen Electric generator tester. 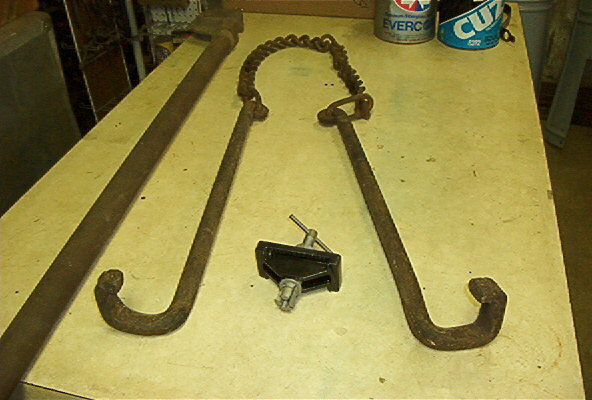 One in front removes spindle arm bushings and the rear one removes the front spring perch from the axle. I collect mostly "Stevens Speed-Up" tools but have KR Wilson also. Unca Jack - Could you please loan he that one right there in the center? 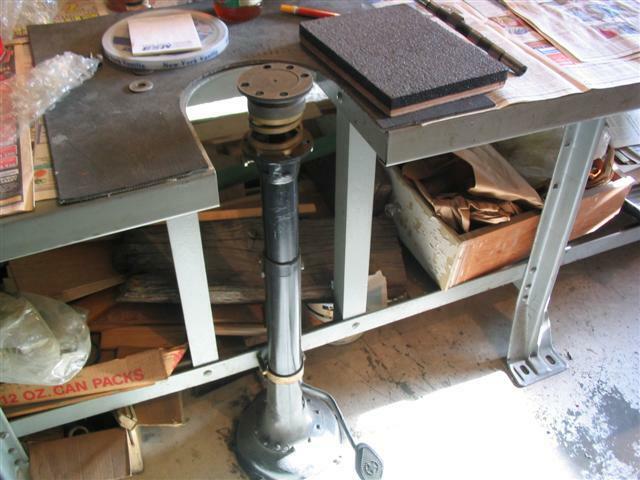 Seriously, I think there could be a market for the rear end lifting set, made from hand forged rear axle shafts. 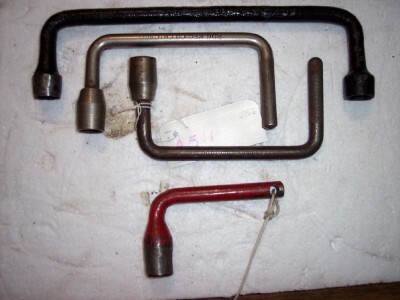 The original Ford Shop Tool that I would hate to loose the most is the Stevens Rear Axle Race Puller. I have guys from Northern Colorado bring me their rear axles to work on including sometimes just removing the race for them. The Stevens Rear axle race puller is the best by far for doing that. 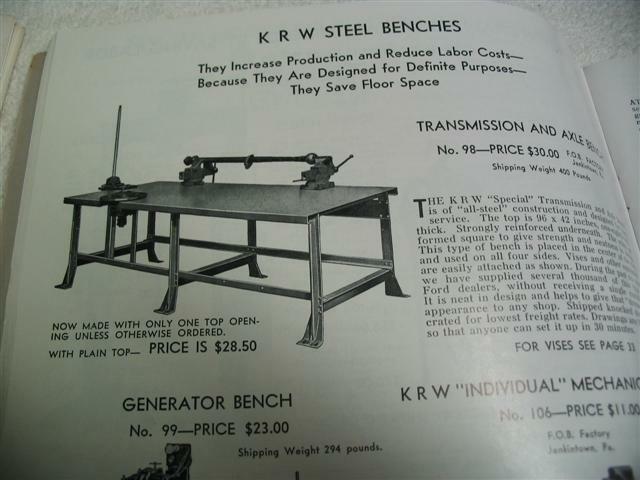 people are so enamored over KRW and Z tools that they overlook the other original tools. I am afraid the picture not show the handles on top of the picture bery well. On real tough races I sometime use a cheater on the handles. But this is very very seldom needed. 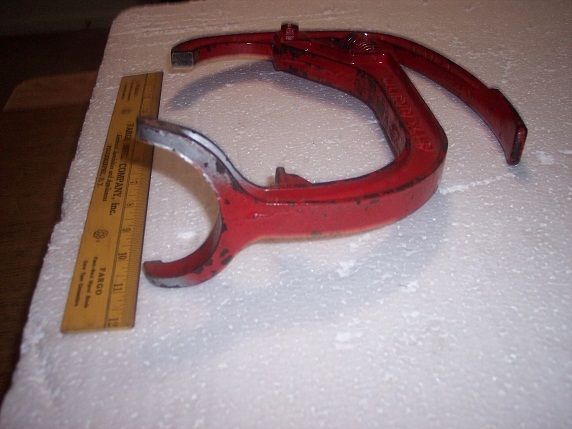 I have had this tool for about 30 years and have only found one race that I could not pull. I agree with Dave on this one. A friend of mine has one and let me use it many years ago. I wish I could find one. Dave has a lot of very nice tools,I hope he shows us more of them. I would like to show a couple more rear axle race pullers. I hope the pictures show. I am having a tough time with the new program since Kodax sold theirs. If the picture shows the large read one the left is for trucks. I bought these many years ago for little of nothing thinking that if I only have to use it one truck they will pay for them selves. I spotted them somewhere and knew what they were by the round thing sticking out at the bottom that all rear axle pullers must have. As near as I can tell the company name is CANTRELL. The smaller one of coarse is for cars. Here's a couple of my favorite tools. 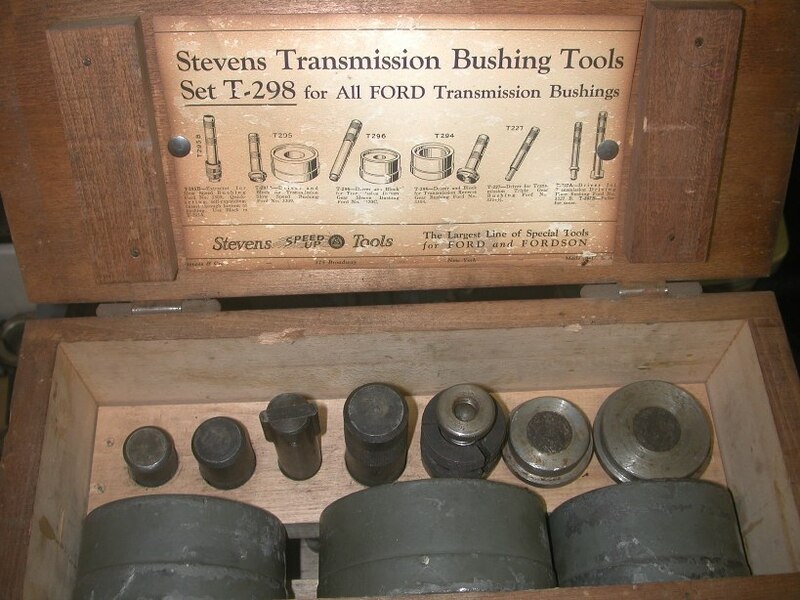 The Stevens drive shaft kit and the transmission bushing tools. I hope this picture is not too small to see. I had to ask the guy I bought it from at a swap meet what it is for. Its the most usless shop tool I think I have. I usually don't buy a tool that I don' think I am going to use but this was so unusual that I bought it any way. It is just a wall hanger. 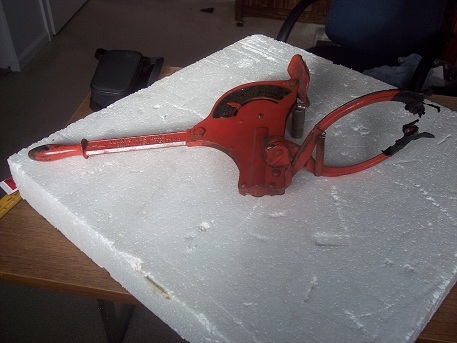 I would like to see if anyone can ID this tool. If not I will explain it in a couple of days. I will take another picture of the whatzit tool and see if I can repost it. Nice Kim - I have both of those kits also but my Driveshaft kit has the later style inner sleeve puller - my wife found it - no kidding ! 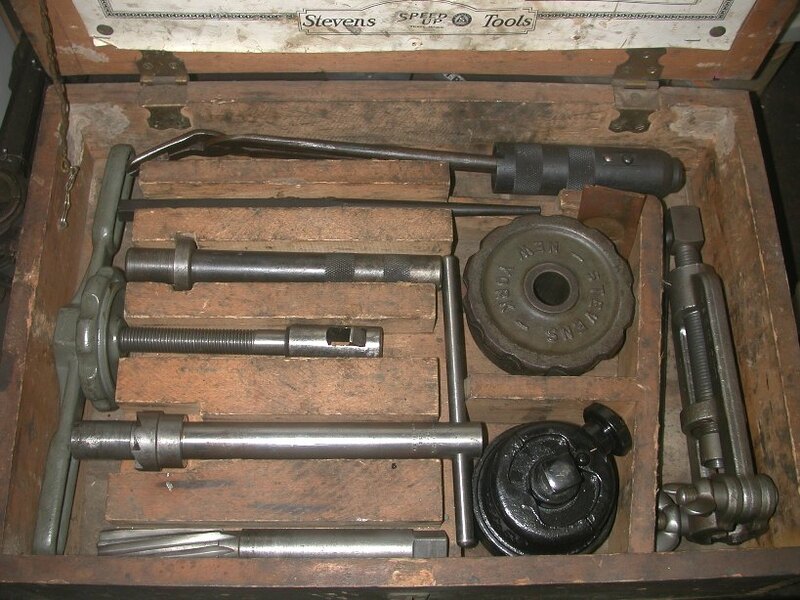 I was fortunate enough to find the Stevens starter & generator rebuild kit also - will take a photo tomorrow. Might have to show a photo of the Stevens "Extra Hand" manifold holder that I purchased from you too. Dave that black thing is a pinion gear puller. I have the set also. I found a set of valve seat refacers at a junk shop for $5. They are Sioux. 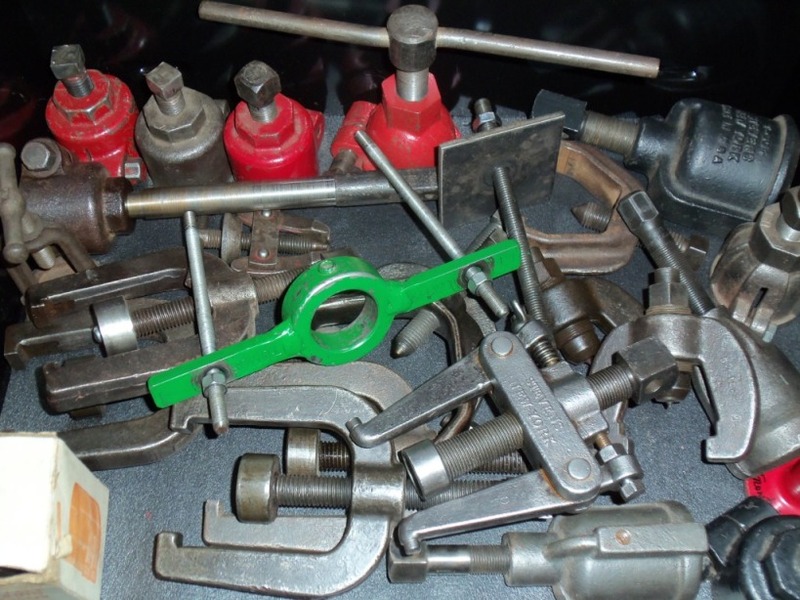 I bought this valve tool last year at the Loveland, Colorado Swap meet. 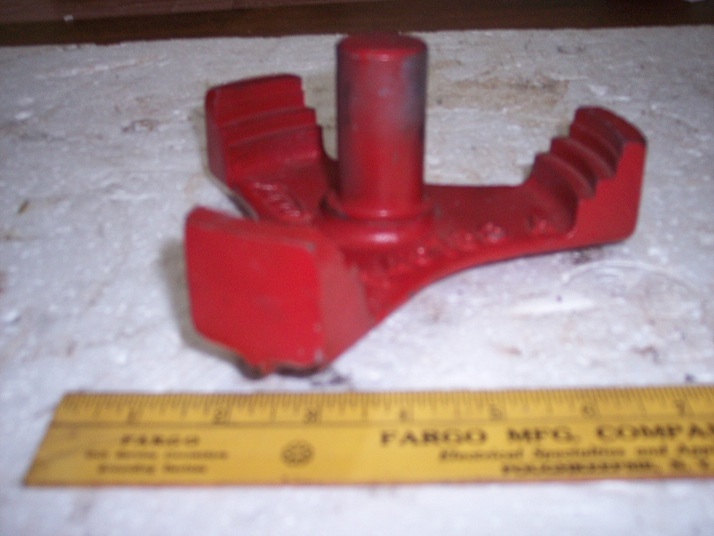 It is a cast iron valve tool unlike the steel ones you see so many of at swap meets and auctions. It has Loveland Ohio in very heavy embossing but no company name. Another wall hanger but I got it because I thought it looked kind of neat. This is what I got this summer. I should have recognized the pinion puller I have the same one in my set. Boy are they handy. I am going to try one more time to post this whatzit tool and see if anyone recognizes it. That is a nice set. I have a few of them but I don't use them much because I do not find it necessary to change bushing in the drums. I almost never find them worn. The green bible says you can have .005 clearance with no problems. I almost never find that and when I do I have a surplus of good bushings out of cracked drums. I far trust the brass in the original bushings than I do the reproduction ones. I do however always replace the triple gear bushing as I have NEVER found any that the ridge was not worn allowing the triple gears to ride against the fly wheel. I forgot to say I see that the set is a Stevens. 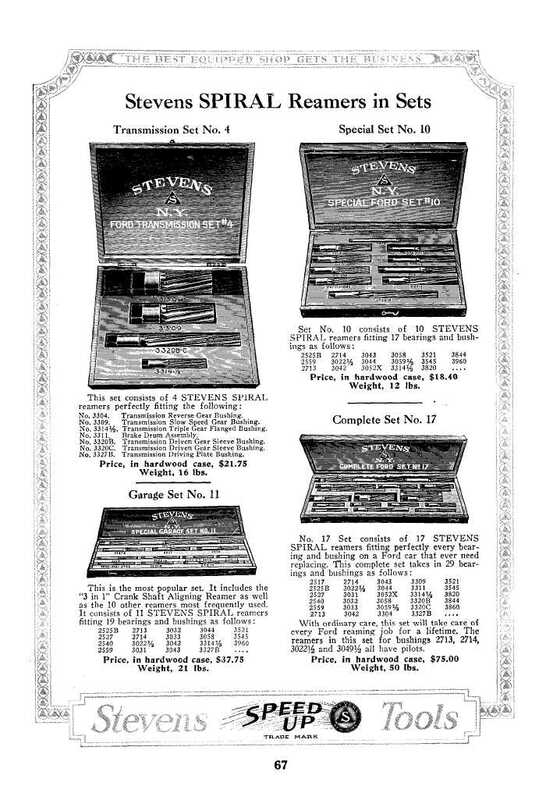 Stevens made a lot of very good tools for the shops in those days. A lot of my better tools are stevens, even my tire changer. 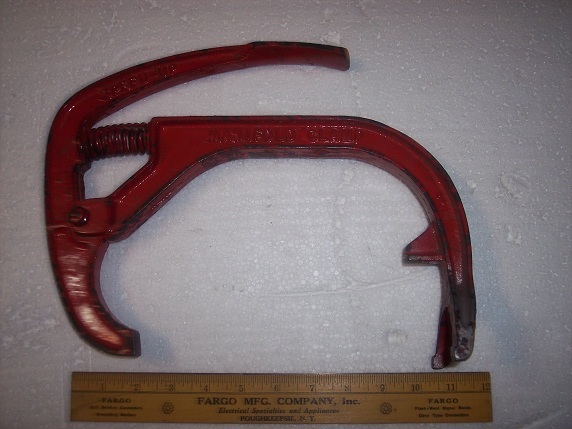 Another Tool that I frequently use and would really hate to lose is the Manifold Clamp. This clamps the exhaust manifold to the block while you install the intake manifold. The spring is so strong I can hardly squeeze it. It sure make the job of installing the manifolds a lot easier. Its another Stevens. The sticker says it is a No. 4 set, but it has 17 pieces in it. I thought the number was a reference to the number of pieces. I might be wrong. I will try the pictures again. The computer says they well under 200 KB but they still are too large. Nice clamp Dave, never seen one of those before. I have only seen a couple of them around at swap meets. I bought one at Chickasha (my second) but a friend saw me with it and asked if I would sell it to him, so I did. I did not even get off the grounds with it. When ever I install new brakes, emergency or trani, I always use this brake checker. I had the ends that clamp around the wheel wrapped in tape so it would not mar the wheel but it looks like I wore most of it off. Many years ago I had a friend who restored a 26 T. I would go backwards but not forward. After a lot of searching he found that one of his rear axle brake drums had a low spot. 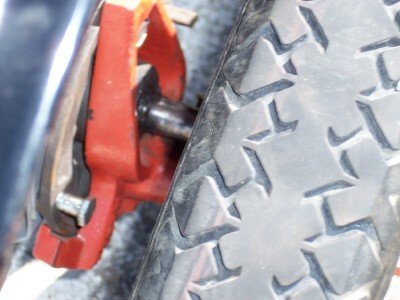 the brake shoes could pass by it going backwards but would activate the brake shoes going forward. A different brake shoe and the problem solved. The low spot was not noticeable. I found this drum checker and use it when replacing a rear axle brake drum. 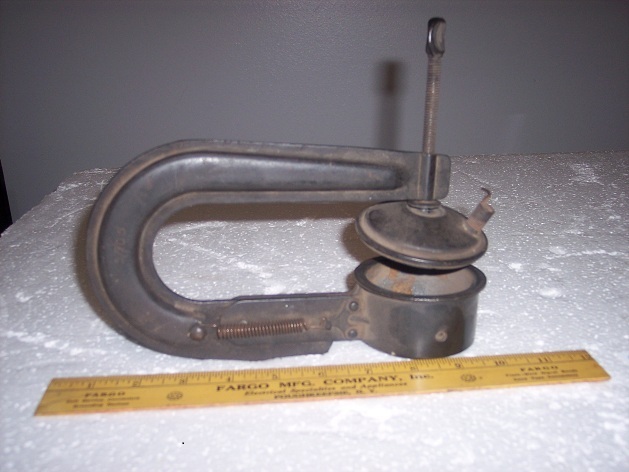 It is a Bear MFG Co. Rock Island Illinois fixture #1432, DRUM MIC. 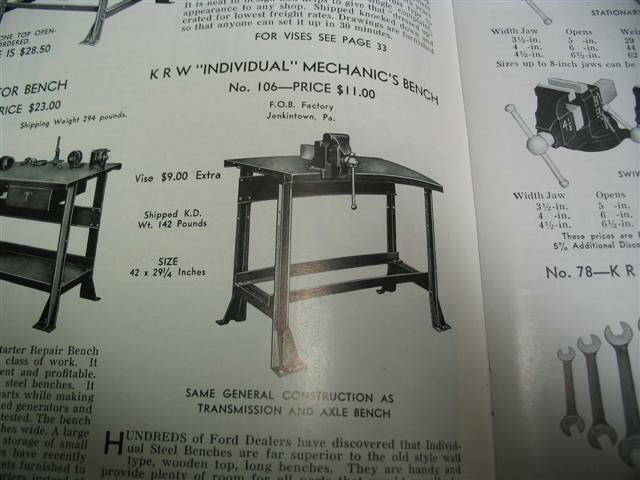 Vintage Ford calls the two tools below cam gear pullers. I have also read somewhere that they are steering wheel pullers. That is what I use them for. I can find no embossing on the Red one. 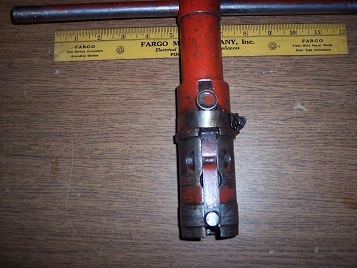 The other puller has L 1000 on one of the legs and HM 132 B on the handle but no company name. All I can say is they are super good at pulling steering wheels. 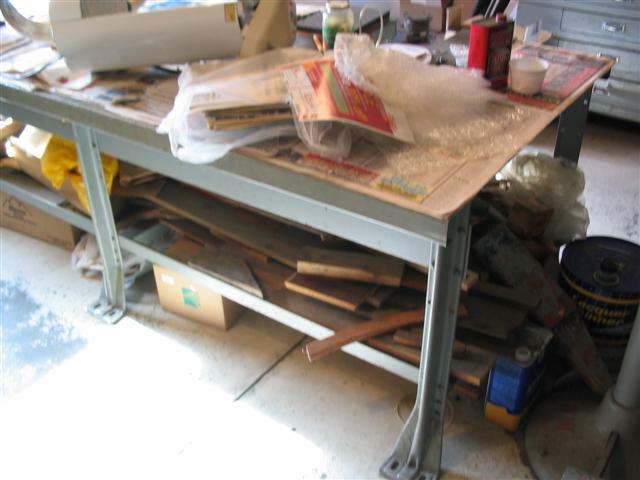 Here are some pictures of some Wilson work benches I have. They were sold through the Catalog. I have two of the Large Benches. 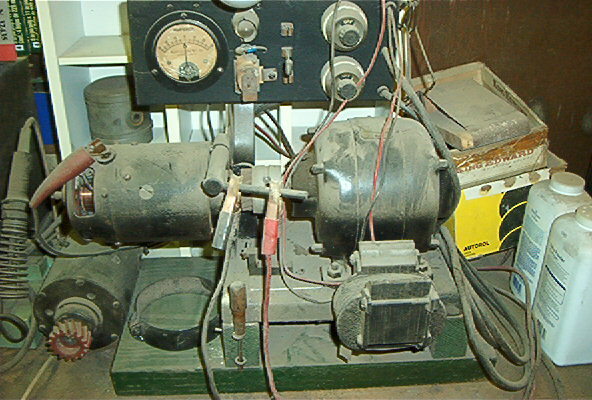 Two of the Generator, and Starter benches. 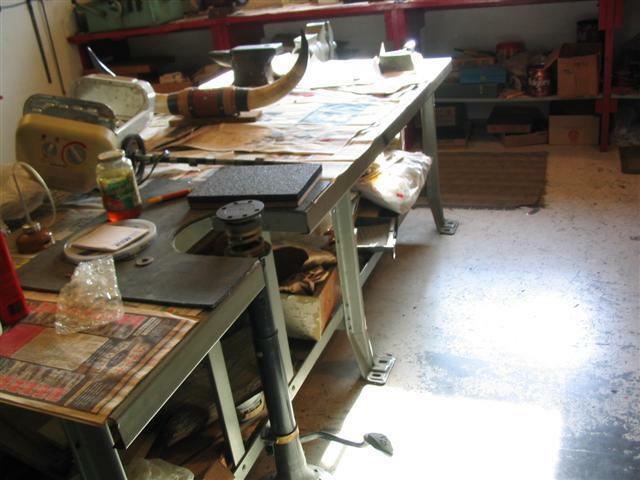 One of the Mechanic's Bench. Many guys have not seen any of these, so here they are. Where in the heck did you find those benches, Herm ? Old Ford Garage Sale, about 47 years ago, Steve. 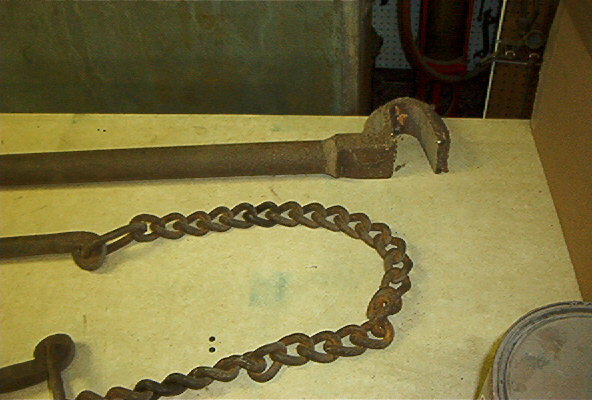 A very unusual tool used in the Model T hay day. Its a cartridge holder for cutting holes in windshields for the Clymer through the windshield spotlights. Embossing on the tool says that This tool is leased and not sold. It remains the property of FYRAC MANUFACTURING CO. Rockfor Ill.The Title reads also Fyrac-Clymer. The It also reads "night guide safty light"
I hope I can post a picture???? When I try to post picture I have been getting some weird stuff. But I will try again. One thing that I would like to have more info on is the size and markings on the different bushing reamers and drivers; and what bushings they are used on. Does anyone know of such a list in any book or online? No Pics Dave on my end. 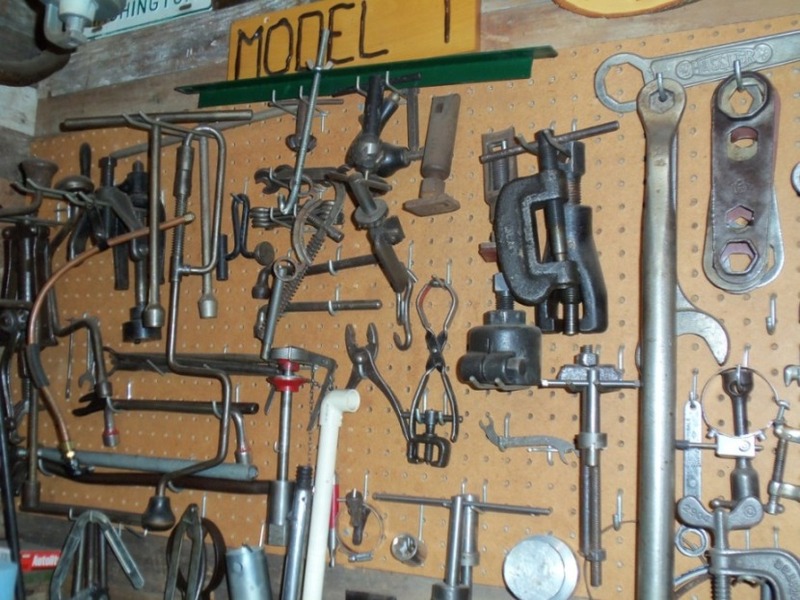 I still have a lot on interesting old Ford Shop Tools that I would like to post, but I give up. Most of my old reamers say FORD on them. If I get time today I will try and get you some numbers. Which reamers are you particularly interested in ??? 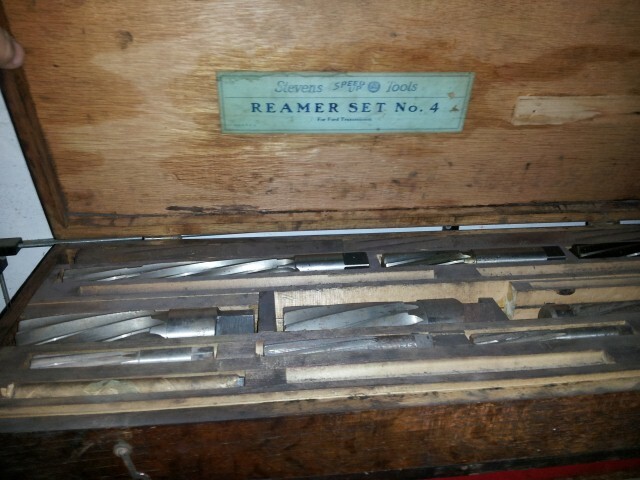 The reamers I have have a number that is the number of the bushing that it reams. 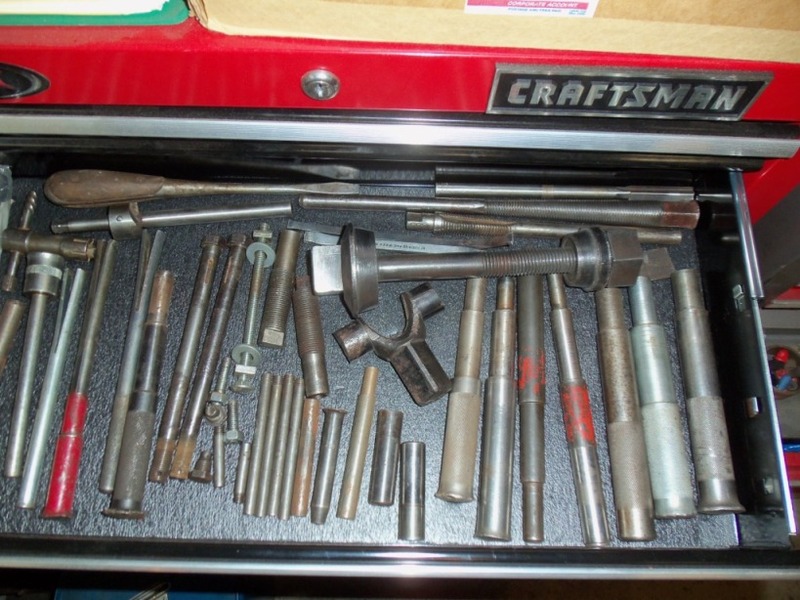 Right now I am mainly interested in the numbers of the reamers for the spindle bushings, front and rear spring shackle bushings, drive shaft, and maybe those used for transmission rebuild. Do you know how Dan Robitaille is doing? I understand the Dan has stopped doing upholstery work for people. I also understand that his lungs or heart are giving him a lot of problems. Other than that I have not seen or talked with Dan in over a year. Dan's upholstery work was the best I have ever seen. It's too bad that he is not able to do upholstery work anymore. 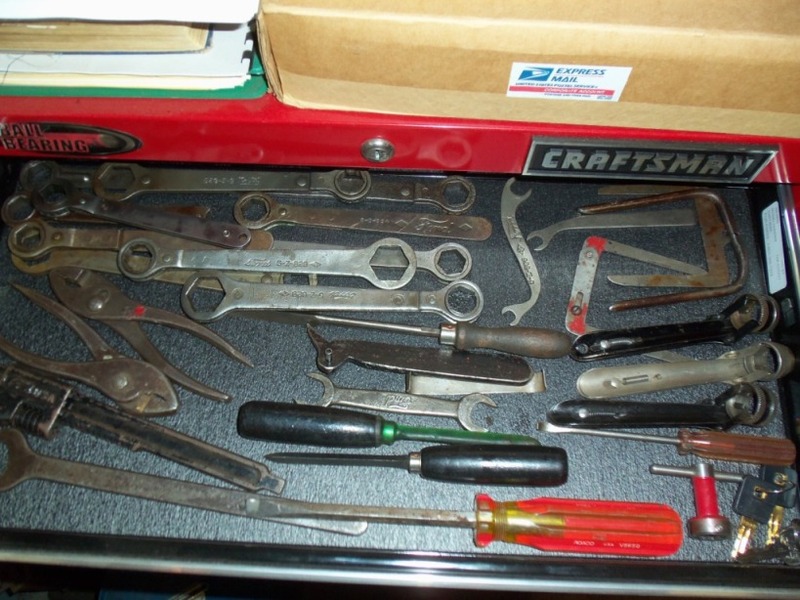 As far as the pictures of the tools that I use are, I think I will hire someone to come in and help me. There is a fellow here locally that even goes to Asia to do Computer work. He has done work for me in the past and is very reasonable. I can still post my old Kodak file pictures but not the new ones. One thing that has improved is I don't always have to type in my Username and Password every time. 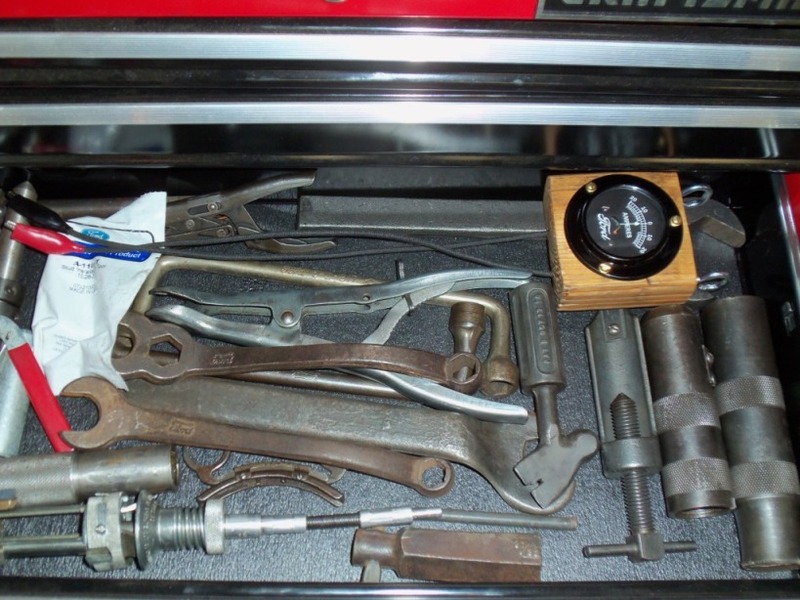 The tool in the picture above is a Clymer cartridge holder for install Clymer through the windshield spot lights. I thought that it probably used sand but I don't know, I have never used it even though I have some Clymer spot lights and I think they really look neat on a car. I do find that a fair number of windshields either have spot lights or at least did. I had one of those and I donated it to museum last year. They are not that common. How do you suppose it was used, I don't have a clue.